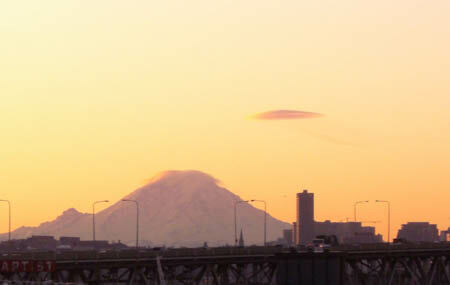 For example, if you could enlarge a one-centimeter-long ant so that its gaster (tail) extended over downtown Seattle and its antennae hung over Mount Rainier, a strand of ant DNA would be about two centimeters in diameter–about as wide as a US nickel. A hydrogen atom in that DNA strand would be roughly a quarter of a centimeter in diameter, or about as big as a pepper grain. A human red blood cell would be much larger, about as big in diameter as the length of two full-size cars end-to-end. Going to the other extreme, if you shrunk the solar system so that it spanned the distance between Seattle and Mount Rainier (with the sun half-way between), then the sun would be 11.6 meters (about forty feet) in diameter, just a little bit smaller in diameter than the width of the Space Shuttle Mobile Launcher Platform. By contrast, Jupter would be about 116 cm (almost four feet) in diameter, and Earth would be almost 11 centimeters in diameter, or a little smaller than a softball. A trip from Earth to its moon would cover 3.16 meters (10 feet, four inches), but the nearest star outside the solar system would be much farther than Mount Rainier; in fact, the miniature astronauts have to go all the way past Rainier, out of the atmosphere and to the moon. Zooming out even farther, if the Milky Way galaxy could span the distance between Seattle and Rainier, then our solar system would be somewhere near Burien. You’d have to look hard to find it, though, because our entire solar system (all the way out to the Termination Shock) would be only about 1.2 millimeters in diameter at that scale, about the size of a pin head. If we zoom out again and compress the entire known universe to one Rainier distance from Seattle, then our Milky Way Galaxy would be 6.3 centimeters in diameter, or about as big around as a bracelet. Wow! You’ve come a long way of calculating from Mount Rainier and all the space, galaxy and stuff in equal to a size of a bracelet. That’s ironic.